Breading and baking is not the same as breading and frying. Seriously, it’s not. So I won’t start this post with: “It’s like the real thing! You’ll fool everybody, even yourself!” Because you won’t. But this is not what my post and my recipe are about. This post is about how no matter if you fry or bake, breading something without eggs can be frustrating. It takes a lot of time to toss all these vegetable slices in liquid and bread crumbs. And then these ungrateful things fall apart the minute you look at them. In the past I have had the best success with a mixture of water and cornstarch. That is how I usually make celeriac schnitzel. But today a can of chickpeas was sitting on the counter while I was slicing the beets. And you know what’s coming next.So far I have only used the miraculous chickpea brine aka aquafaba as a stiff egg white replacer in meringues, marshmallows, and ice creams. But of course aquafaba can be used is savoury recipes, too. And with much less work. For this recipe there’s not much you have to do and of course you won’t need a mixer. Just pour your aquafaba into a shallow bowl and some bread crums into a second one and start tossing your vegetables. Which is something you really should try out because this method is the quickest and best one I have ever tried. Your breading will stick, I promise. And it will get crispy, too. (Okay that does not so much depend on the chickpea brine but on the oil that you should spray your schnitzel with.) I mean look at that. This breading is not going to abandon you. 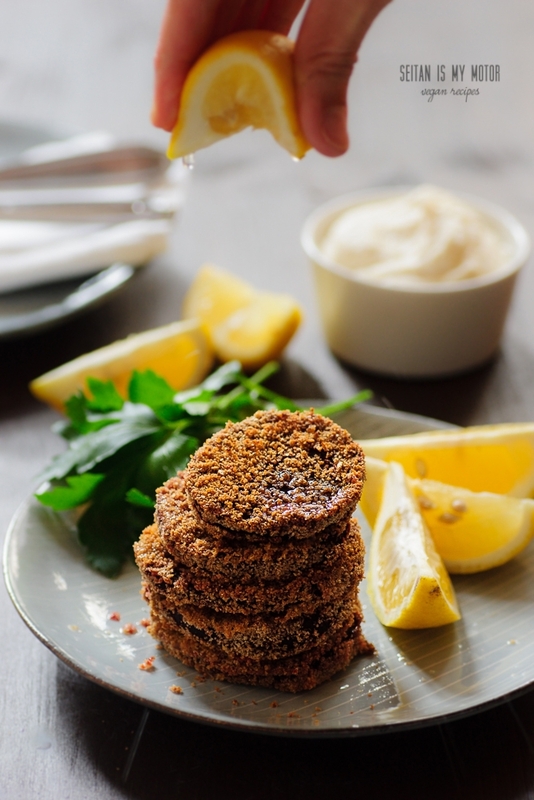 I recommend serving these breaded beet schnitzel with lots of lemon to add some balance to these rather sweet vegetables. They are also nice with a plain almond cream cheese (recipe included). What do you think? To make the beets, preheat the oven to 200°C (400°F) and line a baking sheet with parchment paper. Pour the chickpea brine in a shallow bowl. Add mustard and pepper and mix well. Pour the bread in a second shallow bowl. Coat the beet slices with chickpea brine and then with bread crumbs. 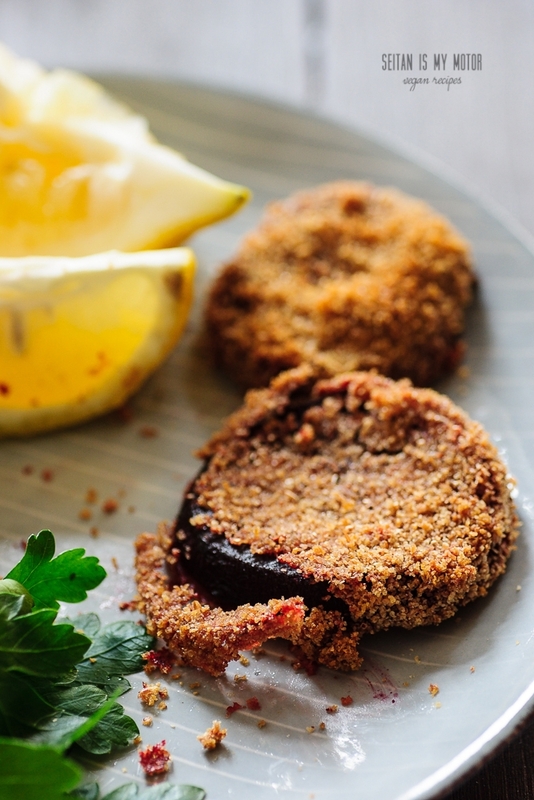 Bake for 30 minutes or until the beets are soft and the breading is crispy. To make the almond chream cheese, place all ingredients in a blender and blend until smooth. Scrape down the sides from time to time. 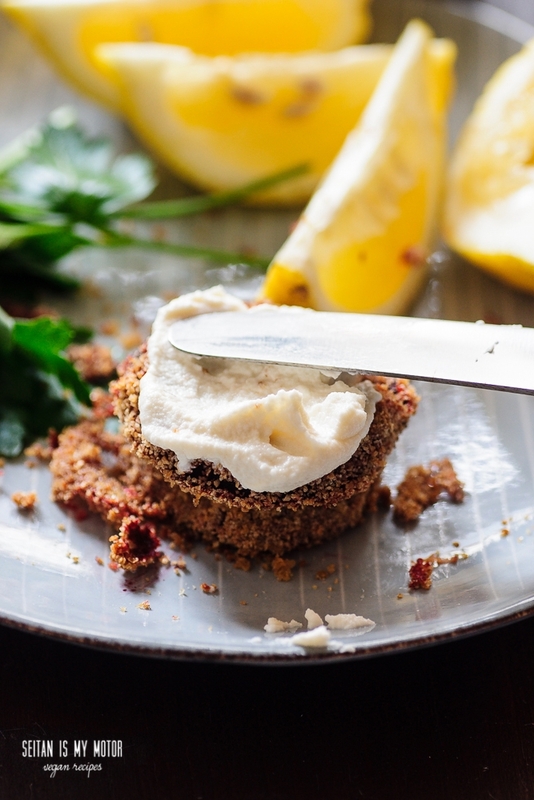 Serve beets with lemon and almond cream cheese. * To roast garlic wrap the cloves in a piece of aluminium foil and bake at 200°C (400°F) along with the beets. I usually bake a whole garlic bulb at once. Great idea for using aquafaba! Ahhhh beetroot one of my favourite veggies. I love them anyway they are prepared. Will definitely give this one a try! Yummy, sieht sehr gut aus. Danke für die Tipp!